Ransomware usually catches people off-guard. Most people do not worry about ransomware or any malware, but then they hit with malware. That is when they realize that backups are non-existence or way too out-of-date to use. At that point, depending on the situation their only option is to either wipe everything and start over again or pay the ransom. So, what would you do in this situation? Ransomware is a type of malware used for encrypting victim’s files on the computer and then forcing them to pay money to get them back. Usually, the only way to pay the ransom is by using untraceable digital currencies like Bitcoin, Monero, etc. How Ransomware Infects Your Computer? The most common and effective method by which ransomware infects a computer is through email. Be it through an infection on a computer or through random spam, the creator of the ransomware will send an email to people and businesses with email subjects such as “Invoice Report For your Payment.” The attachments present in those emails could be an executable file disguised as a PDF file or Microsoft Word document with malicious scripts implanted as a macro. If you receive the executable type of ransomware, then the attacker is banking on the idea that you won’t have file extensions turned ON in your computer. The malicious file could have a name with .pdf and even have a PDF icon. If you look at the extensions of malicious PDF attachments in an email, it will have a .exe extension. Make sure to update all your devices (computers, mobile devices) on time. Updates mean drivers, applications, security patches and operating system updates. Hackers can exploit software bugs found in the software application. So, it is critical for you to keep your devices up-to-date. This will help them prevent exploits like ransomware to a certain extent. make sure to avoid surfing the internet on the server. For this reason, Internet Explorer present in Microsoft Windows Server, for example, comes with advanced security features. Make sure to back up important files. If possible, compile all of the sensitive business data and store them on cloud storage. Backing up the important files on a regular basis can save your data even if your computer gets infected with ransomware. Download software programs only from trustworthy sources like Windows official store. You should refrain from downloading software or any other files from untrusted sources and websites as they are unreliable in terms of security. Most of the sites which let you download apps for free often supply you with software carrying adware or malware. 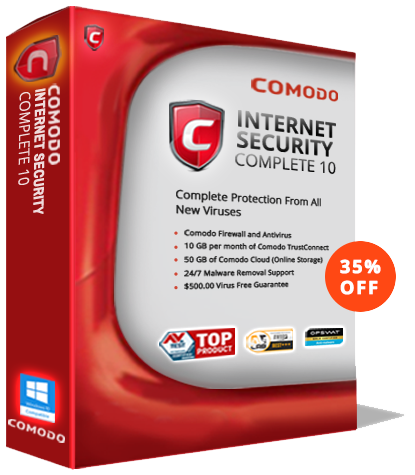 Install Comodo Antivirus to protect it from any malware threats. Comodo Antivirus outdoes all other antivirus software as it quarantines the unknown file and executes them in the isolated system environment. With its Containment engine, Comodo Antivirus can prevent any malware with ease including the ransomware. Apart from Comodo Antivirus, no other AV product can protect your system from zero-day attacks.